Vietnam soldier’s grafitti, mis-identified by Smithsonian Magazine as a “mystery poem”, turns out actually to be from Buffy Sainte-Marie’s song Universal Soldier. In 1967, a young G.I. was lying on his bunk on a troop carrier headed to Vietnam. On the canvas bottom of the bunk above him, he carefully wrote a few lines of free verse in Morse code. That piece of canvas was donated along with a few others to the Smithsonian Institution in Washington, D.C., where a historian was studying wartime graffiti. As a weapon of the war – And without you all this killing can’t go on. The historian published the “mystery poem” in the Smithsonian magazine. It prompted hundreds of letters, more than any other the editors had received on any other article. They were mostly from Vietnam vets. Some were scolding. Every one pointed out that the mystery poem was actually an extract from Buffy Sainte-Marie’s classic song, Universal Soldier. The Smithsonian editors were deservedly embarrassed by their inability to recognize such an important part of ’60s culture. They sent a letter to Sainte-Marie apologizing and offered to send her copies of the letters their readers had sent. Sainte-Marie wrote Universal Soldier in 1962, a time when people fretted over missile gaps, Khrushchev and the H-bomb. Vietnam was still a couple of years off the American radar. She had been writing songs in college while studying Oriental philosophy. She hadn’t considered music a career. She wanted to be a teacher, a vocation still close to her heart. At the time, she wrote songs without thinking anyone would hear them. Then she got the record deal. Universal Soldier was released in 1964. It wasn’t long before the song became the anthem of the anti-war movement, despite the fact it was pretty much banned on U.S. radio. Vietnam soldier’s grafitti, mis-identified by Smithsonian Magazine as a “mystery poem”, turns out actually to be from Buffy Sainte-Marie’s song Universal Soldier. In the October 2004 issue of Smithsonian Magazine, a “mysterious poem” was quoted. The words were inscribed on an American soldier’s canvas in 1967 as he was on the way to Vietnam. His name was written above the poem in Morse Code. 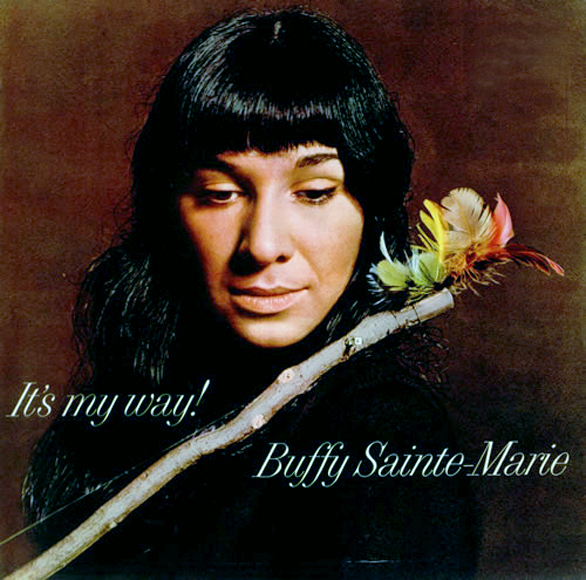 The ensuing weeks after the magazine hit the streets brought more than six hundred letters, faxes and emails to the magazine’s office, from readers who pointed out that the poem was not a mystery at all, but from Universal Soldier, Buffy Sainte-Marie’s famous 1962 anthem of the peace movement. The magazine staff apologized sincerely and sent Buffy several packages of the incoming readers’ comments. Beltrone convinced Maritime Administration officers that the messages left on the canvases were part of America’s history, and needed to be saved. They agreed, and since the first discovery Art and his wife, Lee, who is a photographer, have repeatedly visited the ship, the General Nelson M. Walker. The Beltrones removed not just the graffiti-inscribed canvases, but other artifacts as well, and were able to interest almost a dozen museums around the country to accept and curate the objects, so they could be preserved for future generations. One museum recipient was the Smithsonian’s National Museum of American History. The Beltrones delivered four graffiti-covered canvases to the museum, along with a complete three-tier bunk, and other material. Smithsonian Magazine became interested in the delivered canvases, and featured one in their October, 2004 issue. One part of the canvas features a Morse code message, and at the other end, two long lines, that are quite meaningful today. Art Beltrone was able to learn the identity of the soldier who inscribed both. His name was Robert Simpson, and he lived in Plainwell, Michigan. He had been drafted in 1966 at the age of 21. The Beltrones never got to interview him, however, as he was killed in an ultra-light plane crash in 1992. “You’re the one who must decide who’s to live and who’s to die. The Smithsonian article, in “The Object at Hand” department (pages 40 and 42) is titled “Kilroy Was Here,” a reference to the graffiti left by World War II soldiers. The front page of the story features the Morse code inscribed canvas; the two line message text was included in the story copy, and was also used, as it actually appears on the canvas, in a small photo on the department’s “contents” page at the beginning of the magazine. In the text, the writer described the two lines as a “mysterious poem.” Art Beltrone too thought that. But not a good number of Smithsonian readers. Smithsonian Magazine said that they have never had such a huge reaction to any other story in the history of the magazine. They sent several packages of mail to Buffy. Buffy was touched by many of the letters, whose writers – soldiers as well as civilians – said that Universal Soldier had changed their lives. In 2008 Buffy Sainte-Marie sang at an outdoor rally hosted by Veterans for Peace, Code Pink, Veterans Against the War in Iraq and many other groups protesting policies of the Bush administration, singing Universal Soldier across the street from the Smithsonian, where she had a concert and speaking engagement later that day. She also read her poem The War Racket. and Brothers, can’t you see this is not the way to put an end to war? This last line is put not as scolding someone else but as a question to someone you love. Note that the music ends on an unresolved chord.